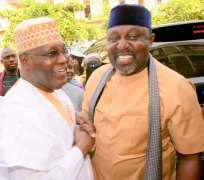 THE Action Alliance, AA, party, formed by the Imo state governor, Rochas Okorocha, in 2005 has thrown its weight behind Atiku Abubakar, presidential candidate of the Peoples Democratic Party. The adoption of Atiku is significant because Uche Nwosu, AA,’s governorship candidate is Okorocha’s son-in-law and chief of staff. Last Saturday at the All Progressives Congress women rally in Owrri, Imo State, Okorocha openly campaigned for the AA’s governorship, urging the audience to vote for Nwosu and and President Muhammadu Buhari, candidate of the All Progressives Congress in the guber and presidential elections, respectively. He said that what he was doing was not anti-party activity but a perfect alliance with the Action Alliance party. In the run-up to the 2019 election, Nwosu, defected from the APC to the AA after he was denied governorship ticket in APC. However, the AA in a statement on Monday, January 14, signed by its official, Keneth Udeze, recognized only Atiku/Obi for president and running mate. The party said the only link Okorocha has with the party is that his son in-law is contesting under the party. Udeze said all the executive committees of the party as well as other members maintains their ground on their support for Abubakar, adding that the will work for the emergence of Atiku/Obi presidency. “The National Executive Committees (NEC) of our party are on the same page concerning our support for Atiku, same with all our state chapters in this matter. We hereby restate out position through this medium that AA as a certified and active member of the Coalition of United Political Parties (CUPP) has not for a moment reconsidered or wished to alter that position. For your information, AA moved the motion for the adoption of Atiku as the Presidential Candidate of CUPP, and we are on it to the end,” he said. It is our unshakable/unfailing resolve to work for the emergence of Atiku/Obi, in the presidential election, and that we must not only be seen to be doing, but to truly do. “The only relationship between him (Okorocha) and AA is that Uche Nwosu is contesting on its platform and we are poised to deliver…. I will not hesitate to invoke from relevant sections of our Party Constitution to deal with erring members no matter how highly placed, as AA constitution which I swore to protect remains supremely sacrosanct. Please be warned,” the statement said.